Did the immigrant population spike after World War I ended, as this Harvard professor predicted? The answer is: it went up slightly. As the below graphic from the Center for Immigration Studies shows, U.S. immigrants living in the U.S. went up slightly from the 1900-10 decade to the 1910-20 decade in pure numbers, from 13.5 million immigrants to 13.9 million, then up again to 14.2 million in from 1920-30. However, the percentage of immigrants as a percentage of the U.S population actually declined during that time, from 14.7 percent in 1910 to 13.2 percent in 1920 to 11.6 percent in 1930. The 2010 percentage was 12.9 percent. 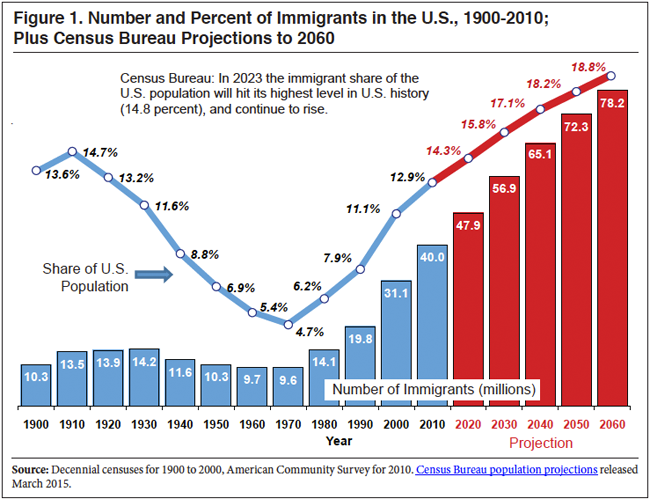 That was originally estimated by the Center for Immigration Studies to reach a near-high of 14.3 percent in 2020 and a new high of 15.8 percent in 2030. It will be interesting to see what effect a President Trump will have on those projections. On the one hand, he could curtail immigration, for example Syrian refugees. On the other hand, if the economy expands due to lower income and corporate taxes, perhaps more people from other countries would want to come here for the economic opportunities, the true “American dream” Trump promises to resuscitate.